The lobby, staff, pool, location and breakfast was nice! The room was clean and comfortable. It had a slight smell in the mini fridge. A very good resort for the price i paid! The free breakfast buffet was excellent. Not to far of a walk to Bangala Road hotspot or Patong beach. Staff was very rude. AC was broken and had funny smell. Staff said buffet was included in my package at check in and kicked my wife and i out buffet mid bite. This hotel is very nice in that it is family oriented and great for couples. Though Patong I would say is not the best place for families as it has been a party city since before I was even born. The beach is nice, but so are a lot of beaches in Thailand. But back to the hotel. The staff is very friendly and accommodating though the hotel is not guest friendly. This includes if you meet a girl that is not Thai at a club and want to bring her back. So if looking to hookup with other tourists or whatever, I would suggest another hotel. Family and couple friendly not a group of guys looking to get lucky. The rooms are nice but not amazing. A good safe place to stay and the pool area is very nice. The breakfast was always good with a lot of options. Didn't eat anything else there as there are many options in the surrounding area to eat. Beautiful hotel and perfect location within a 5 minute walk of Bangla Road and the beach. Friendly staff and beautiful hotel. I would stay there again. Staff was great. Walking distance to every thing. Needs an update aside great hotel. Okay, but if you are male, be prepared to be accosted by the staff of the gay massage parlors as you walk to/from hotel. Breakfast is uninspiring. Rooms in paradise tower have amazing view! As reviews stated you had hear a little bit of the party scene from hotel but I am not a light sleeper. Would have stayed longer if possible! Pool is great (has happy hour, too). Wifi only in lobby and 2nd floor but is available for purchase in rooms. We will definitely stay there again if we get to come back! Hotel is family friendly but also close to boys town, restaurants, beach, and bars. We arrived per van and we went to reception and immediately was asked to pay van bill or they would cancel your rooms. We were asked for a credit card and was stated " I bet you do not have a credit card. We can fill your rooms and you find other hotel.I gave her a Card and they all looked at each other in panic. There were people with luggage waiting in lounge for what looked like a room. I let the older woman who was very disrespectful by her statements,"Americans!" "You do not look like you could pay our prices." She took and copied our info on reservations. She said 3rd party vendors are useless. That whole episode put a horrible feeling that we were not good enough to stay there. I highly encourage Americans stay away from this place. Please check out overseas hotels for prejudice. This hotel is great with super fantastic location. Close to main streets, restaurants, and mall. We had a room with both hill and seaview. We will be back to Royal Paradise Hotel on our next vacation in Phuket. One of the few towers in Patong beach with ocean views and walking distance to the beach and main street with all the action! The multiple pools with waterfalls and restaurants are some great options if you just want to stay within hotel grounds. Very nicely located. Close to all actions. About 10 minutes walk to Patong beach. The high floor room has a nice view of the sea and hills. Good money for the value. they charge for internet cant believe that. only free wifi on second floor. Room was nice but no wifi in the hotel which is ridiculous. close to main attractions. The room you looking for it not in the website very unfriendly staff, noisy Neighbours. Just one night here, but it was comfortable. Plenty of dining and entertainment options. The Royal Paradise Hotel & Spa places you within a 10-minute stroll of popular attractions such as Patong Beach and Jungceylon Shopping Center. This 4-star resort has 350 guestrooms and offers a full-service spa, an outdoor pool, and free in-room WiFi. Relish the Chinese cuisine at The Royal Kitchen, one of 4 onsite restaurants. Savor a meal from the comfort of your room with 24-hour room service, or get a quick energy boost at the coffee shop/café. Start each morning with buffet breakfast, available for a fee from 6 AM to 10 AM. A TV comes with cable channels and pay movies, and guests can stay connected with free WiFi. The bathroom offers hair dryers, free toiletries, bidets, and slippers. Other standard amenities include a balcony, a refrigerator, and a minibar. 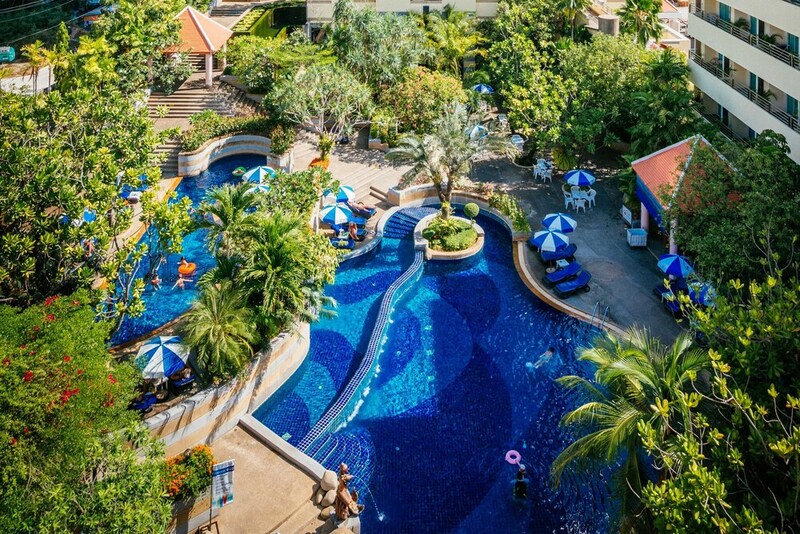 Guests of The Royal Paradise Hotel & Spa enjoy a full-service spa, an outdoor pool, and a children's pool. You can take advantage of free parking, along with an airport shuttle (available 24 hours) for THB 1500 per vehicle one way. The front desk has multilingual staff on hand 24/7 to help with tours or tickets, securing valuables, and luggage storage. Other amenities at this spa resort include a fitness center, a spa tub, and a sauna. Dear Sir, We appreciate for your feedback!and thank you for staying with us. Dear Guest,Thank you for staying with us and sharing your review.We happy to know you enjoyed our facilities and services we provide.Its was pleasure to welcome you and we hope to see you again on your next trip to Phuket. Dear Guest, Thank you for your stay.We hope to see you again. Dear Guest,We can't wait to welcome you back again.Thank you for your kind words. Buffet breakfast is served daily from 6 AM to 10 AM for a fee. The Royal Kitchen - Ocean-view restaurant and bar specializing in Chinese cuisine. Open daily for lunch and dinner. Coconut Coffee Shop - Buffet restaurant and bar specializing in local and international cuisine. Open daily for breakfast and dinner. Casablanca - Poolside restaurant specializing in Indian cuisine. Open daily for lunch and dinner. Fueng Fah - Restaurant specializing in Thai cuisine. Open daily for dinner. Reservations required. The Lobby Lounge - Lobby lounge specializing in local and international cuisine. Open daily for brunch, breakfast, lunch, and dinner. The resort has an outdoor pool, a children's pool, and a spa tub. A sauna and a fitness center are other recreation options. The preferred airport is Phuket (HKT-Phuket Intl. ): 65-min drive, 25.7 mi/41.4 km. The front desk is open 24 hours a day. For convenient arrivals and departures, you can take advantage of the airport shuttle (available 24 hours), which is offered for a fee. Driving? This property offers free self parking, along with RV, bus, and truck parking. 24-hour airport transportation is available. Fees may apply. Guests must make arrangements in advance by contacting the property. The following credit cards are accepted: American Express, Mastercard, Visa, and Union Pay. This resort provides transfers from the airport (fees apply). To make arrangements, contact the property with arrival details 48 hours prior to arrival, using the phone number on your booking confirmation. A resort fee is included in the total price shown. A charge for a mandatory New Year's Eve gala dinner on 31 December is included in the total price shown. Guests are advised that room rates do not include all meals for children. Breakfast and gala dinner fees may be charged on site for some meals when children stay free, depending on age.